© Copyright - Karim A. Khaidarov, December 30, 2003.
and thinking what nobody else has thought. Taking as a fact  the presence of the ether in the Universe, united quasi-isotropic, quasi-incondensible and elastic medium, being the main basic matter, the carrier of the whole energy, all processes, occurring in the Universe, and taking for the base of beliefs about it working model [2-5], presenting it in the manner of twocomponent medium - corpuscular and phase, we will consider some questions of mechanical potential of the ether and resulting from decision of these questions new methods, allowing increase the possibility to see up to limits of actual, present Universe, not a past Universe, the possibility to overcome the space quicker than light. Fig. 1. Ether domain structure. Moving of the phase ether along interdomain borders. A density of empty ether depends on local gravitational potential and it is less on much orders else. Under the action of power of gravitation, which source is the substance, ether "decompaction" occurs, that is to say "bulge" of walls of ethereal domain occurs. Bringing a respect to great predecessor, we will show J. C. Maxwell's picture of the ether. (Fig. 1). Rd = 2.25·10-14 [m] is a radius of domain. Naturally this velocity is a velocity of light, which is typical for all observed forms of moving of the phase ether - free amers. Moving the phase ether (the gravitons) at the speed of light is radial from gravitating bodies along domain borders. With remoting from gravitating bodies these borders (domain walls) become more resolved. The drift of domain walls, and hereunder domains themselves to account of fraudulent interaction  to the side of domains, having greater internal energy  with the second Space velocity of local gravitational pit. The drift occurs to account of condensation of amers on the one sides of interdomain gap and evaporation on the other side under the action of gradient of potential (the pressure) of the ether. At that situation the density of interdomain walls defines local gravitational potential, but difference of their density defines gradient of gravity field. That is naturally results from classical principle of balance. However all of that is only "superstructure" on corpuscular ether, providing mechanism of sources - discharges in the ether, the foam on the surface of corpuscular ether ocean. Real Ether Potential. Statics of the Ether. Two-component ether is in the state of all-round compression. That is a main reason of acting power in him. We will give it quantitative estimation. Va = 4πra3/3 = 1.76793·10-104 [m3] is amer volume, ra is amer radius. Got value and mechanism of forming of phase ether around substance are the main forces, acting within the ether. Any local change of pressure within the ether, caused by moving of phase ether, entails corresponding force, returning outraged part of ether to position of balance. That is just gravitation. Thereof it is possible to draw a conclusion that amers are even so compressed. Consequently bulk modulus K for them is not equal infinity. We Try to find it. At first we will find, how much is amer compression. We will do it on indirect sign, as follows, on difference of inter-domain pressure and ether Young modulus Eo, found by present author earlier in . where Vo is volume of free amer, V is volume of compressed amer. Given value corresponds to typical value of three-dementional share of free volume , fluctuate free volume [9-11], being universal feature of all amorphous vitreous solids and its melts. The Velocity (7) is a true velocity of gravity propagaton in corpuscular ether. This value excludes the unsolved dynamic paradoxes in theories of gravitation, which appear in models with limiting light velocity propagation of gravitational interactions. It exceeds lower estimation of propagation velocity of gravitation, which gave by great Pierre Laplace  - 1017 [m/s], lower estimation of Tom Van Flandern - 1019 [m/s] . On the other hand, integral on time stillness of intradomain amers on the whole visibility is very high. The multiple experiments on measurement of corpuscular velocity of light [St. Marinov, M.D.Torr - P.Kolen and others], measurements of Doppler-effect of Cosmic Microwave Background (ether black-body radiation) [14, 15] have shown, that independently from motion of celestial bodies, macroscopic (statistical) velocity of intradomain amers is a zero both in terrestrial, and intergalactical scales. Solar system moves comparatively this component of the ether at the speed of 390 ±30 [km/s]. It is naturally to assign the question: is it possible to observe the longitudinal waves in the ether, which correspond to the sonic waves in usual substances? For that, it is necessary to define its characteristics. Naturally, the phonons in crystalline materials are the most close analogue of these waves [16,17]. Considering characteristics of phonons, it is possible to notice that they have such discriminating feature, as absence of particle - "kern", as photon has. So phonons can scatter, be formed and disintegrate easier, than photons. They can be refracted and reflected when turning in mediums, having different from usual wave resistance (impedance). Changing the density of phonons brings the change of thermodynamic condition of electrons, that is to say change of the electric resistance of material. Pulse an phonons is sent to torsion balance (pendulum). 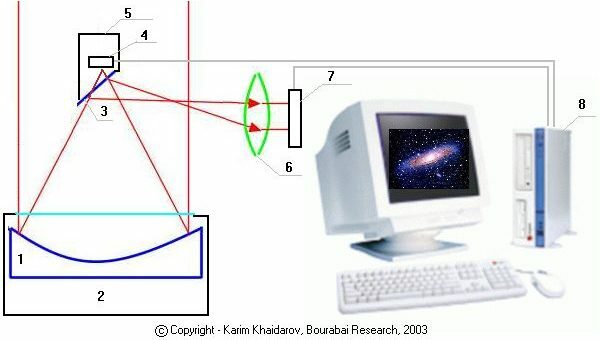 Probably, the first person, who has found ethereal phonons is a genious russian astronomer N. A. Kozyrev . He placed the resistor in focus of telescope, shielded from rays of stars, and got the signal from stars in its present position, computable it beforehand on vector of its velocities. The Results of these experiments there were very unstable, since mirror of telescope practically does not reflect the gravitational waves. So author of current article is offerred advanced variant of telescope for observation of starry sky in gravitational waves - ethereal phonons (see Fig. 2). The essence of improvement is concluded in using the mirror, cooled up to condition of superconductivity. The last has the wave resistance, sharply differrent from empty ether (the vacuum) and materials in it that brings to reflection of gravitational and transverse ethereal phonons. Besides for reception of normal two-dimensional image the resistive matrix, giving the image of actual Universe (the stars in present position) is aplying. The Matrix is placed into shield, protecting it from influence of light and other electromagnetic hindrances. As a matter of convenience adjusting and undertaking the differential analysis optical - gravitational scene in telescope can be an usual optical tract. с - transversal (shear) velocity in the ether. At achievement of superconducting dartboards, having sharply different from empty ether wave resistance, electron, unlike its de Broglie's wave, gets into thick of dartboard, sharply losing velocity. The de Broglie's wave can not get into superconductor and is reflected from it, being the ethereal phonon. Neutral to electromagnetic phenomenas, ethereal phonons pass practically trough any material except superconductors without hindrance. The addition to Podkletnov's experiment is shown on Fig. 2. There is a system of phonon speed measurement, proposed by author of present article. It consists of two sensors 3, installing apart on route of phonon moving and having symmetrical connection on length to oscilloscope 4. These sensors can be both high-frequency piezoelectric microphone, or simply resistant sensors. At placement of sensors on distance 30 metres we must get on screen of oscilloscope a picture, like shown on picture. On mark zero we must see the reaction of sensors on longitudinal phonons, having velocity on much orders exceeding of velocity of light, on mark 10 nanoseconds probably we will see the response from three-dementional phonons, but on mark 100 nanoseconds - response from transverse phonons, spreading at the speed of light. Described experimental installation even though it does not generate longitudinal, but only transverse phonons, is an unique prototype of cosmic engines of the future. Its specific pulse, which limits puts only of energy capacity of on-board power station, exceeds known cosmic motor installation on much orders . The Factor of transformation of energy in reactive pulse is limited only by toughness of superconductive screen, reflecting phonons. At voltage of runaway 5 MV on 10 times exceeding energy of electron mass at rest, factor of transformation of electric energy in kinetic energy of motion will be nearly 90%. THe insolvency of relativistic looks at nature of Cosmos was experimentally proved by present author in  . Developped working model of the ether and gravitational interactions within ether  have allowed to throw light upon nature of matter  and explains unexplained before phenomena of gravitational variations . Prepaired theoretical base has allowed to develop in work  working model of the ether up to possibility of using the thermodynamics in ether theory. The revising of gravitational potential essence in present work has brought the author to classical notion of mechanical power and has allowed to define the velocity of fast gravitational interaction. Proposed expansion a working model of the ether has allowed to explain Kozyrev's and Podkletnov's experiments, offer the direction of development of new actual astronomy and confirm the direction of Space motor building, opened by Eugene Podkletnov. Date of registerred priority: December 30, 2003. Знаете ли Вы, что низкочастотные электромагнитные волны частотой менее 100 КГц коренным образом отличаются от более высоких частот падением скорости электромагнитных волн пропорционально корню квадратному их частоты от 300 тысяч кмилометров в секунду при 100 кГц до примерно 7 тыс км/с при 50 Гц.